How to remove reddit.com referral spam from Google Analytics stats? Home »	Optimize » How to remove reddit.com referral spam from Google Analytics stats? Issue: How to remove reddit.com referral spam from Google Analytics stats? Please help to block reddit.com referral on Google Analytics. Apparently, the traffic driving via this domain is fake. Thanks in advance! How to block Reddit.com referral spam on Google Analytics? Reddit.com is a legitimate online blog that has thousands of daily visitors. However, for the past two weeks, the site is dubbed as a referral spam by Analytics community. Thanks to Vitaly Popov and its team of spammers who have exploited legitimate reddit.com URL, attached a nonsensical extension to it and sent to thousands of Google Analytics accounts. While initially, the referrer dimension seems to be normal, copying and pasting it into URL address bar on your web browser redirects to the unknown or even suspicious domain. This way, spammers are seeking to drive traffic to third-party websites. 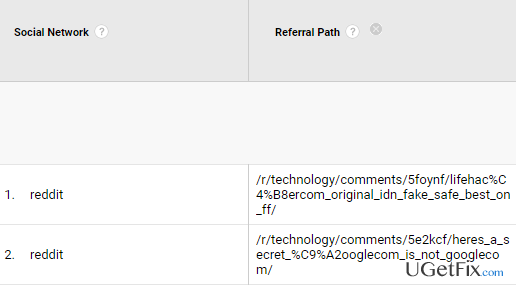 To spread reddit.com referral spam, spammers need to know the Google Analytic’s property ID, which people often keep in public. Using the help of the machines, hackers or spammers, it’s up to you how to call, send fake hits directly to Google Analytics accounts. Reddit.com fake URL then gets injected into Google Analytics stats. It’s usual practice that people go and check what matter attracted visitors to their sites. Since reddit.com spam typically features hundred percent bounce rate, it’s not surprising why so many Google Analytics users fall for checking it. The biggest problem regarding referral spam is related to the reliability and security of the sites promoted. Even though the genuine reddit.com domain is legitimate and safe to visit, the one misused by spammers may reroute to suspicious sites, which, in the worst scenario, may contain malicious codes. In a nutshell, ghost traffic from reddit.com URL perverts Google Analytics data and may cause redirects to unsafe third-party domains. That’s why we would recommend you to remove Reddit.com referrer from your Google Analytics reports without delay. NOTE: if you have already visited reddit.com URL address copied from the data on your Google Analytics account, we would highly recommend you to scan the system with Reimage to check the system for malware. Select Admin -> All Filters. Later on, enter New Filter and type reddit.com in the Filter Name box. Lastly, in the Filter Pattern field, type reddit.com and click Save.